In the third issue of our series of legal insights on owning intellectual property (IP) through a Cayman Islands corporate structure, we discussed the new Cayman Islands Trade Marks Law published on 19th December 2016, pursuant to which a stand-alone comprehensive trademark protection regime was created in the Cayman Islands (the "New Trade Marks Regime") to replace the current system of extension of existing UK/EU IP rights. After a few months of waiting, the Trade Marks Regulations, 2017 (the "Regulations") were finally published on 26th May 2017, and the new regime is now scheduled to become effective 1st August 2017. In this new issue, we include a brief overview of the new trademark registration process. Preliminary Verifications: After receiving the completed application for the registration of a new trade mark, the Registrar will search the record of registered marks and pending applications, to determine if, in respect of the goods or services for which registration has been requested, there are any marks which are identical with, or nearly resembling the mark applied for, which are likely to deceive or cause confusion1. If any such marks are identified, they may constitute relative grounds for refusal of registration2 and the Registrar will notify the agents of both the applicant and of the holder of the earlier mark. Under the New Trade Marks Regime, identical or similar trade marks cannot be registered for similar goods or services, while similar trade marks may be registered subject to the consent of the holder of the earlier mark3 or upon the applicant showing honest concurrent use of the mark for which registration is sought4 . In addition, the Registrar will not accept marks which take unfair advantage of, or are detrimental to, the character or the repute of an earlier similar mark registered or otherwise protected in the Cayman Islands5. accept the application subject to certain conditions or limitations8. If an applicant is informed by the Registrar in writing of any objections, conditions, amendments, disclaimer, modifications or limitations, then the applicant will have sixty days (60) from receiving the notification from the Registrar to either apply for a hearing or to make a reply in writing to the Registrar. In case of a conditional acceptance, if the applicant does not object to the conditions, amendments, disclaimer, modifications or limitations requested by the Registrar, the applicant is also required to notify the Registrar in writing, and alter the application accordingly, within the same sixty (60) days period. In both cases, in the absence of a response within the sixty (60) days period, the applicant is deemed to have withdrawn its application. 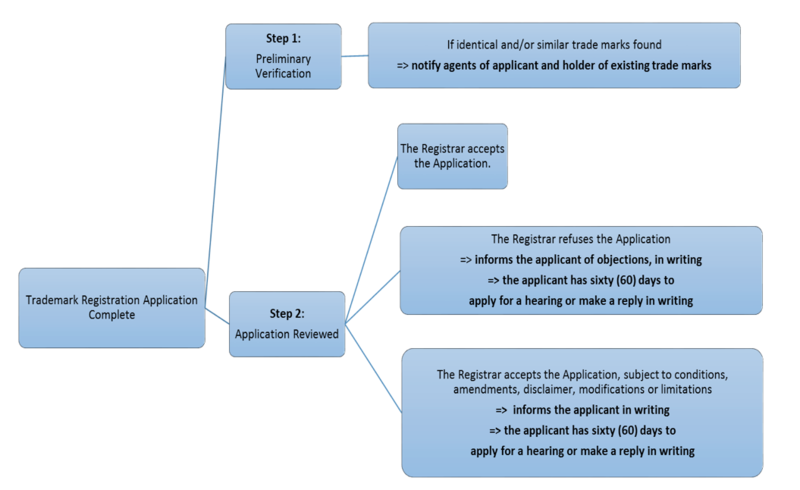 Overall, the registration of a trade mark must be completed within six (6) months from the date of application or the Registrar may treat the application as abandoned9. Opposition Period: Once the application is accepted (or, if conditionally accepted, once the application is amended accordingly), the mark will be published in the Intellectual Property Edition of the Cayman Islands Gazette, under the heading "Applications for Registrations", which triggers a sixty (60) day period for oppositions to be filed10. Opposition Procedure: The Registrar is required to send a notice of any opposition to the applicant, who is then allowed sixty (60 days) to send a counter-statement setting out the grounds supporting its trade mark application11. A lack of response at this stage will be deemed as the application being withdrawn in respect of the goods and services in respect of which the opposition was filed12. Upon receipt of the applicant’s counter-statement, the Registrar is required to immediately send a copy of the counter-statement to the opponent, who has ninety (90) days to submit evidence (by way of witness statement and any accompanying exhibits) in support of the opposition13. 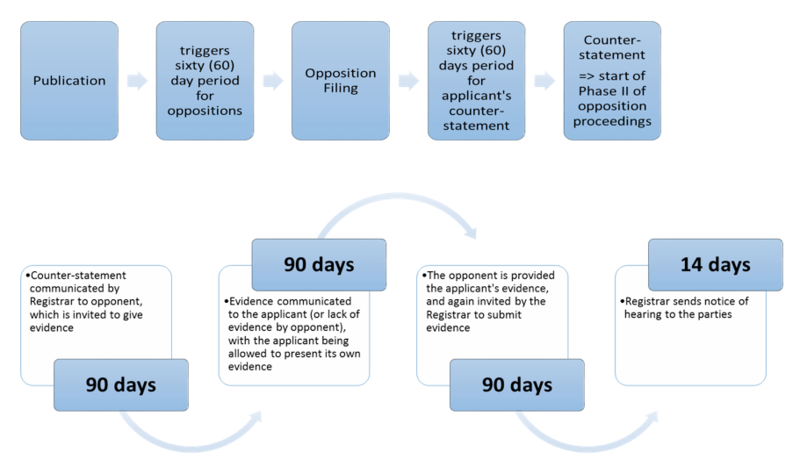 The applicant is communicated such evidence (or notified that the opponent failed to present evidence, as the case may be) and allowed to present its own14, with any submission triggering another ninety (90) days period for the opponent to submit evidence15 before the Registrar will set a hearing date16. In all cases, the parties may waive their right to be heard and request that the Registrar make a determination from the submissions17. The Registrar may also, if a settlement agreement is being negotiated, suspend the proceedings for up to twelve months18 upon a joint application of the parties supported by a statement explaining the nature of the actions taken towards a settlement, the progress made, if the remaining issues are minor or significant, as well as when the parties expect the negotiations to be completed. Overall, the opposition proceedings could last more than twelve (12) months from the filing of an opposition until the matter is heard by the Registrar, without taking account of any suspension of proceedings for amicable settlement or any appeals of the Registrar’s decision. Security Undertakings: If one or both of the parties part of the opposition proceedings are non-resident or do not carry on business in the Cayman Islands, the Registrar may require from the agent(s) to give a written undertaking that such party(parties) will bear the costs of opposition proceedings and/or further security to be given19. Failing to provide such security will lead to the party in default to be deemed as having withdrawn their opposition or counter-statement. Both the registration rules and the opposition process as they are set out in the Regulations are actually streamlined "user-friendly" versions of the UK/EU models. Accordingly, IP agents and other interested parties will be looking forward to receiving further guidance from the Cayman Islands Intellectual Property Office (CIIPO) during the second half of 2017. 4. Article 26 of the Trade Marks Law, 2016; "honest concurrent use" means such use in the Islands by the applicant or use with the applicant’s consent, at the sametime that use is made by the proprietor of the earlier trade mark.